My name is christian Ortiz. I am 16 years old and live in the Bronx, New York. I have a domestic cat named Lucky. When ever my Mom feeds him with food he starts to bite her as if she was trying to get him away from the food that she put in his bowl. What do I have to do to get our cat from biting my Mom? Picture for illustrative purposes only. This is a cat in play in fact. Photo in public domain. This page has been re-dated and updated as it deserves to be brought forward. A blog is date orientated which means old pages get forgotten. Please also read Ruth’s comment. Comments have been disabled. Answer — Hi Christian, thanks for visiting and asking. Of course, at a distance the answer can only be a suggestion. Assuming that Lucky is not ill, it would seem to me that he is being defensive and protective of his food that has just been put out. In other words as soon as it is put out he wants to grab it and keep it in a defensive mode as if he was protecting prey. Domestic cats have never shed their wild cat behavior that is just below the surface. If I am correct this might mean that he is hungry and/or has suffered from a scarcity of food in the past (perhaps he was a rescue cat who had a hard time in his early years finding food). I think what I would do is put out some grazing food that you know he likes. This could be good quality dry food. It might be put out at night and throughout the day but in a controlled way. extra water that is fresh should also be put out. That would take the edge of his appetite at feed time and it might take the edge of his aggressive bahavior when being fed. I presume by the way that nothing is happening in the house that would make him defensive. If there is something going on in the home that makes Lucky generally defensive (such as activity that is unsettling and that makes him nervous) it would put him in a state or readiness to be defensive. The home should be calm and there should be routine in his life and plenty of good cat food. Some play time might also help release some energy and tension. If his behavior continues I would have him checked out for health as there may be an underlying health issue that causes discomfort which makes Lucky irritable. This would also put him nearer the point where he could be aggressive. Good luck – please tell us what you did and how it worked out. Ruth makes a very good point. If Lucky is difficult at feed time it may irritate the person feeding him which may make the eating experience worse for the cat and so things go downhill as Lucky becomes ever more agitated at feed time. A restart to the whole process with good food in place and plenty of love and calm should do it if Lucky is healthy. Michael has given you very good advice, all of which I agree with. Also,maybe your mother could put Lucky’s food ready in his dish and the dish in the place he normally eats before letting him into the room he is fed in. It does sound as if he has been starving in the past.Does he grumble while he eats ? If anyone ever advises you to punish him, please don’t, as that only makes cats afraid of you.There is always a good reason why cats behave as they do. 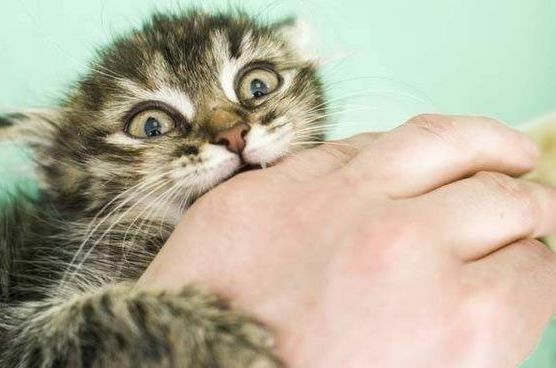 This entry was posted in cat aggression and tagged cat aggression, cat bite, cat feeding behavior, reasons for cat aggression by Michael Broad. Bookmark the permalink.